As a relatively small island, the coast of Menorca is one of its strongest tourist attractions. Wherever you go on this island the sea is not far away, making the coast a focus both for property searches and leisurely exploration. Menorca is unique amongst Balearic islands in its established coastal path. The Camí de Cavalls is a historic path, 185 kilometres in length, that will take you by foot around the entire island. Dating from the fourteenth century, the path originally served a defensive purpose under British rule. King James II required all settlers to maintain a horse for defence purposes and the path enabled them to patrol the coast of the island. Its use remained functional under various periods of French and British dominance and was restored as a publicly accessed heritage feature in 2010. Taking the route in stages, the Camí de Cavalls is a wonderful route for keen ramblers to experience the coast of Menorca. Clearly signposted and easily accessed, it’s an activity that can stretch across many visits to the island. For some, the Spring and Autumn may be the best time to take on longer stretches of the pathway. Even taking the sea breeze into account, temperatures could prove challenging at the height of Summer. Helpfully, stretches vary in length so you can choose where you ramble according to the season! As Menorca is such a small island, bicycle is a great way for active visitors to explore the coast. Across the island, there are over 3,000 kilometres of paths, roads or tracks which are bike-friendly. As long as your vehicle is suitable for off road, that is! To stick to the coast, the Camí de Cavalls is once again a wonderful resource. For those who seek a challenge, look at the annual Tour of the Lighthouses Race in early May. It sets off from Es Mercedal and takes in lighthouses around the coast in a 210 kilometre circuit. From glass bottomed boats to catamarans to private speedboats, there is a huge variety on offer here. You can experience the Menorcan coastline both from a distance at sea to right up close with cave and beach drop offs. There are boat tours leaving from most coastal resorts, so it’s best to work out which beaches you want to explore and go from there. Many tours include some kind of food and drink so you can enjoy the coast in comfort and luxury! If you prefer your ocean experiences a little more hands on, sea kayaking is a great activity to pursue. Tours can take you exploring into caves or experiencing the coast of the National Park of S’Albufera. If you prefer days out to be on your terms, at your times and without working up a sweat, perhaps a beach tour by car is for you. You can aim to visit a different selection of beaches with each visit to your Menorcan holiday home. With a distinct contrast between the North and the South coast of Menorca, the beaches here are breathtaking in different ways. Let’s face it, you’ll never get bored of those views! With a backdrop of rocky limestone cliffs, the South of Menorca takes in the buzzing port of Mahon and its picturesque surrounding beaches. With white sand and crystal waters, these beaches are idyllic for anyone seeking an escape. Try Cala Escorxada, Es Talaier and Binigaus. A much more rugged area but no less beautiful. 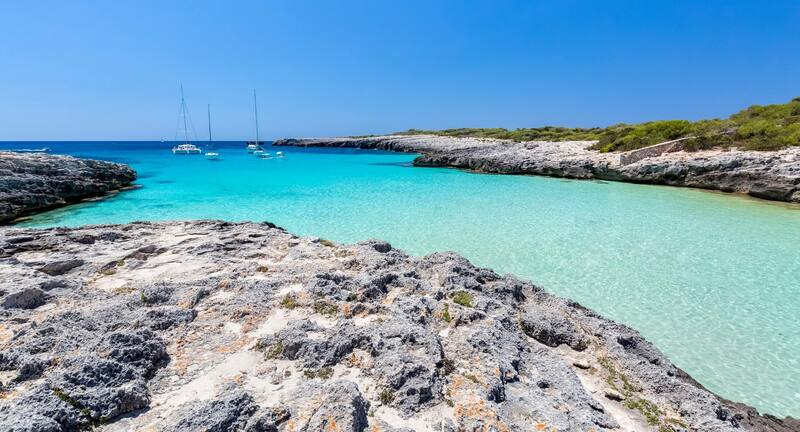 Experience Menorca in its natural and unspoilt state by visiting its Northernmost beaches. The National Park is on this coast so you can enjoy a beach within a lush biosphere reserve. Try Cala Pregonda, Cala Cavallería and Cala Pilar.